Our highly skilled team provide ticketed welds, Lloyds approved hull plating and ship repairs, installation and removal of marine equipment, (winches, gearboxes and engines), with marine refrigeration pipework installation and vessel installation and removal. Anchor Engineering strives to provide engineering excellence in all that we do. We specialize in heavy mechanical engineering, machining, fabrication and fitting. We offer you a total range of engineering services within our industrial engineering. Anchor Engineering has experience and knowledge in all facets of Boiler installation and maintenence, from boiler repairs and service, burner repairs and tune-ups, controls, wiring, water testing and refractory repairs, also full heating and mechanical design and installations and in the use of multi fuels. 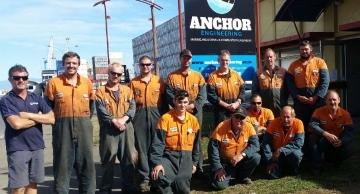 Anchor Engineering Ltd is among the more well-established companies operating in Port Nelson specialising in marine, industrial and combustion engineering. Our highly skilled team provide engineering excellence in all that we do. We specialise in heavy mechanical engineering, machining, fabrication and fitting. We offer you a total range of engineering services. Give our team a call on (03) 546 9949. Located in sunny Nelson, becoming part of the Anchor Engineering team means working on a number of varied projects both at our workshop and off-site on the local fishing fleet, being part of a friendly, relaxed & experienced team, all while taking in the relaxed lifestyle this wonderful part of New Zealand has to offer. Meet the team at Anchor Engineering. Feel free to get in contact with our friendly team.